The Paris Agreement has all the key elements of the Dynamic Contribution Cycle, but it fails as it stands to harness fully their potential to ‘ratchet up’ country contributions. However, this can easily be remedied. In August 2014, a number of senior developing country negotiators developed an idea for sequencing contributions in the Paris Agreement at the tenth anniversary ecbi Oxford Fellowships and Seminar. They published it as “A Dynamic Contribution Cycle” (DCC), with Xolisa Ngwadla (South Africa) and Jose Miguez (Brazil) as lead authors. 0.0.1 How did the DCC idea fare in Paris? How did the DCC idea fare in Paris? provision of shorter-term predictability though the inscription of the five-year term contributions with a medium-term indication of how the contributions are going to evolve (thus avoiding being caught by surprise every five years). 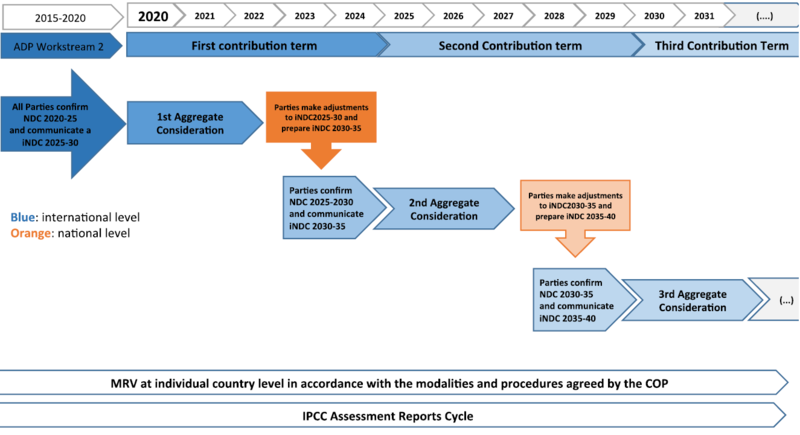 The communication and updating cycle of theContribution Framework is divided into two tracks due to different time-frames envisaged for the initial Nationally Determined Contributions (NDCs): paragraph 23 of the Paris Outcome Decision defines a five-year time-frame track (or “§23 track” for short), and paragraph 24 a ten-year time-frame track (“§24 track”), depicted in Figure 1 (a) and (b), respectively. The §23 track begins in 2020 with the communication of five-year 2025 and 2030 NDCs. This is followed in 2025 with communications of five-year 2035 NDCs, 2040 NDCs in 2030, and so on every five years. The §24 track begins in 2020 with the communication of ten-year 2030 NDCs. In 2025, they are to be nationally reviewed and updated (or left as they are). In 2030, new ten-year 2040 NDCs will be communicated, to be nationally reviewed and updated in 2035, and so on. The Contribution Framework thus uses the key ambition tools of the DCC, but divided between the two tracks, with the result that the rolling medium-term time horizon is only used in the §23 track, while synchronised updating is confined to the §24 track. The shortcoming of the §23 track, i.e. its failure to incorporate a synchronised updating process, can be remedied by simply adding every five years the request to update the next NDC, as illustrated in Figure 2.a. The situation may seem more problematic in the case of the §24 track, where the issue is not updating but the lack of a running medium-term time horizon. But again, this can be fixed. To explain this in concrete terms, take the case of the EU NDCs. Given the INDC submission, it stands to reason that the EU will adopt a §24 track ten-year time-frame for its NDCs, beginning with a 2030 NDC of a 40% reduction with respect to the 1990 base-line between 2021 and 2030, meaning that the average annual EU emissions over that time-frame will not exceed 60% of 1990 emission. The problem with the §24 track as it currently stands is that there may be no communicated medium-term indication as to how the EU NDC is going to evolve after 2030 until 2030, when a new NDC will have to be communicated. Given the Kyoto Protocol experience, this is sub-optimal as regards ambition and durability of the Agreement, but fortunately it can also easily be remedied. The crux of the matter is: what is to happen in 2025? According to §24, there is a communication or updating of NDCs every five years. But which is it to be? Following the EU’s original ‘mid-term review’ idea, one could expect an updating of the 2030 NDC. While this, on its own, would be sufficient to satisfy §24, it is important to keep in mind that the language of §24 does not imply that one could not simultaneously do such an update and communicate a new NDC! Indeed, it would be perfectly possible to communicate a 2035 NDC with a ten-year time frame, a reduction of, say, 60% below 1990 benchmark, in the sense of average annual emissions between 2026 and 2035 not exceeding 40% of 1990 levels. 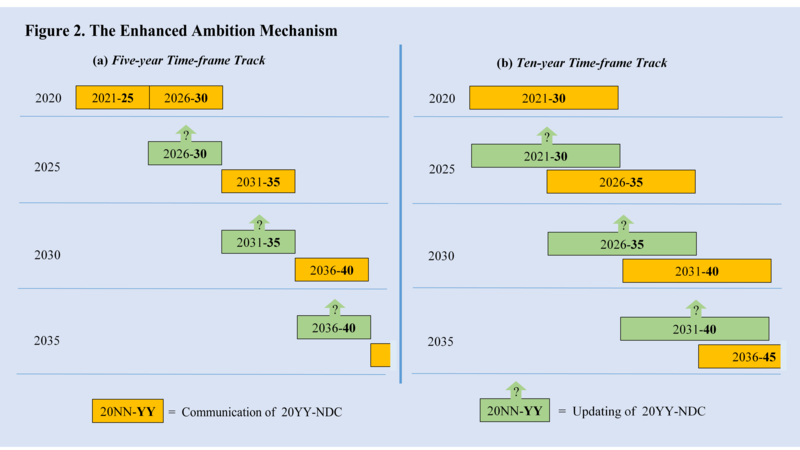 In other words, it is possible to make mid-term communications of new NDCs under a ten-year time-frame track because there is no reason, in principle, why time-frames cannot overlap, as illustrated in Figure 2 (b). In negotiation terms, the full potential of the DCC ambition tools could be harnessed simply by requesting all Parties in 2025 to communicate a 2035 NDC and update their 2030 NDC, and to do so every five years thereafter. It is in this sense that we are pleased to see the DCC proposal to have emerged with the yellow jersey (‘maillot jaune’) from the ‘Tour de Paris’. One of the main shortcomings of the Kyoto Protocol was precisely that there was no ex-ante indication on the ambition of the second commitment period until the first one was about to expire, which led disruptive uncertainties, and indeed speculations that there will be no second period at all. Brazil proposes a “dynamic contribution cycle”, based on ten-year periods, with two five-year contribution terms. The purpose of this approach is to allow the adjustment of contributions with a view to enhance ambition, while providing long term perspectives for Parties and stakeholders. Each 10 year cycle includes a 5 year contribution term, followed by a 5 year indicative Before the end of the each contribution term, the indicative term would be either confirmed or adjusted upwards, and an additional indicative term would be communicated for the following period. In 2015, Parties communicate an intended contribution, pursuant to decision 1/CP.19. 2020-2025 and communicate an indicative contribution for the period 2025-2030. Between 2020 and 2023, the COP conducts the first Aggregate Consideration Process as described below. The outcome of the Process is a set of decisions or recommendations to be taken into account by Parties when adjusting their NDC for the next 5-year term (2025-2030) and communicating the indicative NDC for the subsequent 5-year term (2030­2035). Between 2023 and 2025, Parties make adjustments to their NDC at the national level, as appropriate, register their confirmed NDC for the term 2025-2030 and communicate a new indicative contribution for the term 2030-2035. Between 2025 and 2028, the COP conducts the second Aggregate Consideration Process, restarting the cycle. During the implementation phase of the new agreement under the Convention, the COP shall regularly assess the aggregate effect of the NDC towards achieving the objective of the agreement, with a view to inform Parties in adjusting their NDC towards enhancing ambition in all pillars of the Convention. The Aggregate Consideration Process will assess the progress towards the goal of holding the increase in global average temperature below 2°C, as well as the adequacy, scale and predictability of the delivery of means of implementation to developing countries for the implementation of their NDC. The assessment of the adequacy, scale and predictability of the delivery of means of implementation to developing countries would consider the aggregate level of pledges and actions, including south-south initiatives, to support the implementation of the NDC of developing country Parties, in relation to the aggregate level of support required, as informed through the NDC and included in the registry referred to in Means of Implementation. The contribution of each country to limit the increase in global average temperature below 2°C. Beyond the general topics above, it may not be necessary to detail all aspects of the Aggregate Consideration Process in the agreement itself. The agreement may mandate the COP to agree, before 2018, on the modalities and procedures of the aggregate consideration process, including, as appropriate, the adoption of a simplified methodology for each country to calculate its share in the global average temperature increase. Because the expression “intended NDC” has been associated with the proposal of a ex-ante review prior to Paris, we have preferred to use the expression “indicative contribution” to highlight this is a different approach. Nevertheless, both expressions refer to a similar concept, i.e. a NDC that is yet subject to changes. This entry was posted in Uncategorized on 28 February 2016 by Benito Muller. Climate leadership in a historical perspective and lessons for the implementation of the Paris Agreement: reflections by a former negotiator. GCF Board: In need of a cultural revolution! We need Geo-engineering . . . of Consumer Aspirations! John Harris on GCF Board: In need of a cultural revolution! Revue des blogs – mercredi 22 août 2018 – Veille énergie climat on Climate leadership in a historical perspective and lessons for the implementation of the Paris Agreement: reflections by a former negotiator. Clive Sherlock on We need Geo-engineering . . . of Consumer Aspirations!